On Monday, 6th of January, 2014, I attended my first Mindspeak at the Intercontinental. Like everyone else walking out of the packed room, I had a smirk on my face, and no, this was not due to the croissants that people were going to have for tea. Christine Lagarde had done an awesome job there, I was impressed. I'm quite surprised that Lagarde is not a diplomat, for she is quite good at the art of wooing people and making them look forward to the idiomatic trip to hell. But then again, that's her job, and I it looks like she really does earn her salary. See, being in the same room as the International Monetary Fund and what are respected economists in this country, I expected that we would ask the hard questions, that Lagarde would break a sweat. That never happened. I don't know what the issue was, we did not do our homework? See, living in a country like Kenya, IMF does impact your life a lot. In her talking notes and in answering questions later on, Lagarde made it clear that her trip here was not a courtesy call, she was here for work. She then went ahead to say that the IMF is in the business of bailing out countries, and doesn't come in if a countries policies are on the right tracks. But what's IMF's business exactly? IMF stepped in to bail the Asian countries in the 1997 Asian Financial Crisis. Then, something to do with the real estate and lack of enough trade to support the exchange rate of Thailand's currency saw its value collapse. This in turn led to the collapse of currencies in neighbouring Indonesia, Philippines, Malaysia, South Korea and even Japan. Then, IMF came in to support their currencies, with most currencies losing their value against the US Dollar by between 30 percent and 40 percent. The Indonesian currency took the crisis personally by losing 80 percent of its value. A country like Kenya is a chief importer, which means that were we in Asia then, stuff would have increased price wise by at least one third of their current values to almost double. For every KSh. 100, you would be paying between KSh. 130 and Ksh. 180 the next year . (Medicine worth Ksh. 2,000 now would cost between KSh. 2,600 and Ksh. 3,600 in 12 months). The IMF already assists Kenya, since we also do have a kaslight kaproblem in terms of production and export. But then, IMF just doesn't help us like that. They give you money, and conditions. I will base most of the remaining article on the Action Aid report. Focus on production of goods for export rather than domestic production. SAP is technical talk for "Structural Adjustment Programmes", or rather loans from IMF and their terms. The biggest impact of IMF policies has been a freeze on employment by the government and the continuing threat to reduce government workers. In the Moi eras, a good number of civil servants were actually sacked retrenched ( - a better term from the donors for the barbaric act of cutting a bread winner from their source of income). They also want wages for the remaining workers reduced. The issue here, as IMF rightly notes, is that we have economies that don't produce as much. For Kenya it's worse. Lagarde kept praising our economic growth rates of 5 percent, yet countries like ours normally grow at 10 percent. 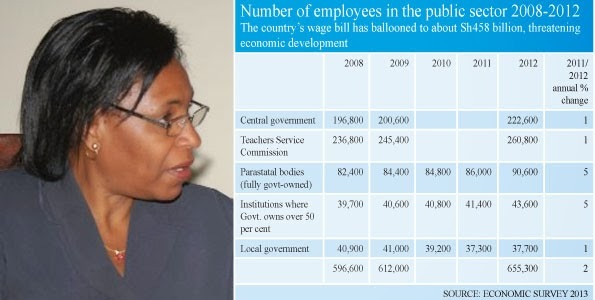 If you sack civil servants, you are basically taking away money from the economy. Civil servants have a guaranteed income, which is what drives bank loans and consumptions for a good portion of the private sector. I don't think reducing civil servants or their wages is as good an idea as IMF makes it sound like, unless you mean the civil servants who earn KSh. 3.7 million a month. The move is likely to hurt those that earn less than Ksh. 50,000 a month. Mind you, they want us to reduce government employees in a country facing a shortfall of doctors, nurses, police officers, and teachers. The IMF still thinks they are too many. And this is in a country why joblessness is becoming a big headache. Another bone to pick, from Action Aids report, IMF is a staunch fan of you paying for government services. As if you don't pay income taxes, and Value Added Tax, and Railway Development Levy, and Fuel Levy, and contribute 6 percent of your income to the NSSF. The Nordic Countries are the most developed in the world. Guess what they do? They employ a high number of government workers and ensure that health and education are available for free or at a very affordable cost. Put it, if you got a very bad accident in these countries, you would not need to hold several harambees to raise your hospital bills. You would end up in a hospital with enough doctors and nurses. IMF investing in a country convincing "leaders" of a country to accept its money and policies when the currency hasn't fallen overnight is apparently a good sign for Western donors and investors, that they can trust in the country. The IMF has more than 180 members who vote on its policies. Major IMF decisions require an 85 percent majority vote. The United States of America has a 17 percent say. 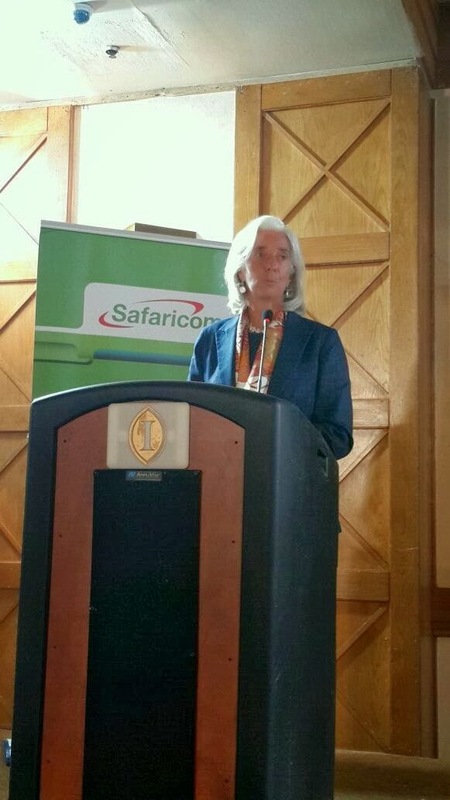 I was also surprised that Vimal Shah, head of the Kenya Private Sector Alliance, in his address (I'm confused who it was to, he kept glancing back to Lagarde and rarely speaking to the hundreds facing him) didn't really say much, or raise any issues. The closest questions to real issues was one Aly Khan asked by proxy, of how IMF benefits a pastoralists in North Eastern. As for Madam Lagarde, she does a brilliantly good job representing the IMF, we just failed to take her to task! I'm not an economist, but I speak my mind.